Cat’s eye gets its name from its shape resembling cat’s eye. Cutting Cat’s eye in different styles enhances its colors and it is most compatible with Zodiac Sign of Virgo. This Gem Stone is ruled by Ketu and used as a remedy for Ketu in Indian Vedic Astrology. 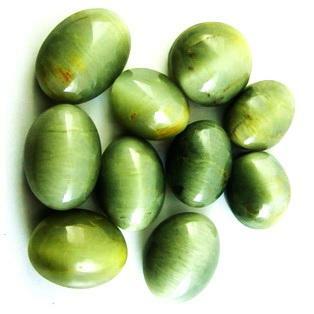 It can be helpful in treatment of problems relating to head, moreover, bones and joints aches can be treated with Cat’s eye. It gains energy if kept among rock crystals and other Cat’s eyes. If we talk about treatment of physical disorders, then Cat’s eye is effective in treating bronchitis, asthma, migraines and headaches. Identifying visual Strong cat's eye looking light band caused by minute reflection on included characters crystal fibers and also natural and fingerprint inclusions. 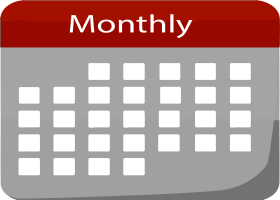 Psychological disturbances like depression can be eliminated and, it can also be helpful in maintaining concentration. Its golden color reflects that it is from quartz family. Hornblende fibers in the Cat’s eye are stuck at one direction which reflects sovereignty and integration. 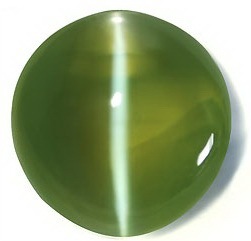 Cat’s eye is not recommended to use for a longer period of time as it produces the large amount of energy. It should be executed after attainment of healing and recharge in sunlight. 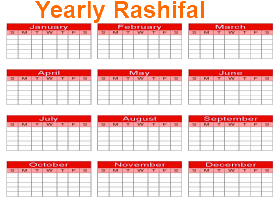 Cat’s eye can be found in India, Australia, South Africa, and America in shimmering, golden brown and striped colors. It is mostly available in the form of jewelry and should be used in contact with the body that will magnify its healing qualities. 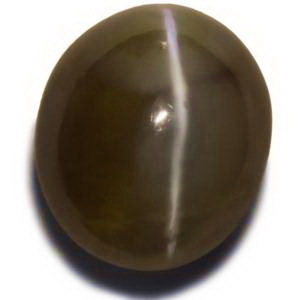 Cat's Eye is available in various size in Oval shape. It is recommended that you should wear not less than 2 Carat and not more than 6 Carat depends on you need. Cat's eye is one of the expensive Gem available and having is big price range depending on the color and quality. A cat's eye starts at Rs 2,000/- per Carat. 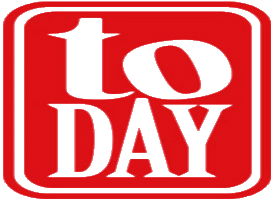 Next quality is Rs 3,000/- per Carat. A very good quality Cat's eye is available at around Rs 7,000/- per carat and Excellent quality Cat's Eye is available at around Rs 12,000/- per carat.